Back in January 2018, gasoline was $2.01 per gallon, and has since risen to $2.79 here in North Florida. However, due to the current price collapse, it is now down to $2.21 per gallon today, 11/17/2018. President Trump said he "DID THIS" the other day in his press conference. I wonder if will drop back to $2.01 by January 2019. If memory serves, gasoline was $1.78 per gallon when Bush left office, and later reached $4.25 under Obama. to update title to show new status.. rising.. not dropping.. Interesting that there is such a variance across the country. "Regular," or 87 Octane, remains at $2.80/gal here in Northern Vermont, and Super (91 or 93 octane) sits at $3.40/gal. I have seen zero drop. Diesel remains stubbornly high, apparently due to refining mismatch and of course the onset of Winter consumption of the equivalent, #2 Heating Oil. Some gasoline here is actually refined in East Montreal, then trucked over the Border. The crude is dropped in Portland, Maine, then run up via a pipeline to the refinery in Montreal. Not clear what is triggering the higher pricing, as gasoline and diesel are both available from refineries in New Jersey, brought in by barge to New Haven, Connecticut, then up a pipeline and by tank railcar from ther to New Hampshire and Vermont. Go figure! Who sets the price of gas across the country? In Illinois the price is down about 7-9 cents a gallon since a year ago. Illinois does have a lower normal average price compared to many other states, but if Donald was looking to get the price to the voter down, I'd call it a failure as far as perception goes. People DO know how much it costs to fill up the tank, and it hasn't changed by more than a couple of $$ over the year. Again, who sets the gas prices? It seems that they raise it immediately, electronically, when oil goes up, but it rarely goes down much when oil drops. What gives? We just filled up yesterday outside Houston for $1.99/gal. The price of gasoline, or crude for that matter, is set by supply and demand, plus a little crystal ball gazing in the case of the latter. Anyone who says that they can control these prices is a fool (and you should not pay such utterances any attention). I'm talking about at the pump. You know, when you pull in to Huck's self serve and fill it up? Update: Today, 11/20/2018, the price of gasoline dropped further to $2.16 in North Florida. like where does the buck stop? hmm I think that depends on whether it's a oil company owned station or not. but suppliers set the price and the stations take a few pennies off the top. Of course the stations technically set the price, but they have very little room to move. But I don't think they use FIFO system of pricing (for example the gas they bought last week is sold using today's prices not the price they paid last week, I would suspect... but I'm just guessing) when the retail stations' margins are so small, I woukd imagine that they tried to get that extra penny or two whenever they can. As for the factors that go into retail prices, for sure crude prices are the bulk of the makeup. but﻿ suppliers set t﻿he p﻿rice and the stations take a few pennies off the top﻿﻿﻿﻿﻿﻿﻿﻿. Of﻿ course﻿﻿﻿ the stations technically set the ﻿price, but they have very little room to move﻿. Over here in Malaysia, petrol (gasoline) and diesel prices are strictly controlled by the government. It doesn't matter which brand of petrol you buy, or where in the country you buy it, the price is exactly the same. Petrol retailers are allowed a few pennies off the top. When the government moves petrol prices up, the retailers get extra profit from the existing petrol supply they purchased earlier. When the government moves petrol prices down, the retailers lose the profit from the existing supply of petrol which they purchased at higher prices. Most petrol retailers here keep less than 1 week or so of petrol supply, so the up or down profits (or lack of profits) are short term. 91 Octane is $3.70/Gallon here in California. Ridiculous. Also, the "Oil companies" DO NOT set the price of oil at the pumps. They are owned by each individual franchise and they set to whatever they want. Oil companies do not dictate this. I thought as much. Are you a franchisee, Bobby? Would be interested what price you guys feel is the maximum you would be ok paying ? Wow those low octane numbers I buy Shell 97 RON or sometimes the lovely 100 RON here in sunny old England for $1.61 per litre ! or $1.70 per litre for the 100 RON. I believe 112 RON ( race fuel ) is available at $3.45 per litre and you have to buy it in a drum. Thats over $6 a US gallon ! Here in California we are paying at ARCO (cheapest gas around) 87 octane was $3.19 at the station i stopped at. Odd that in a different city about 20 mile drive it could be $3.29, a $.10 variance in a location with cheaper local taxes.Plus that town is further inland from ports of water. So what gives out here? Taxation without representation, LOLOLOLOLO . Its a complete manipulation. Absolutely a means of extracting $$$ from the consumer, all the while being feed a line about impacts to our surroundings. 2.70-3.00 dollars a gallon where I live in Utah. 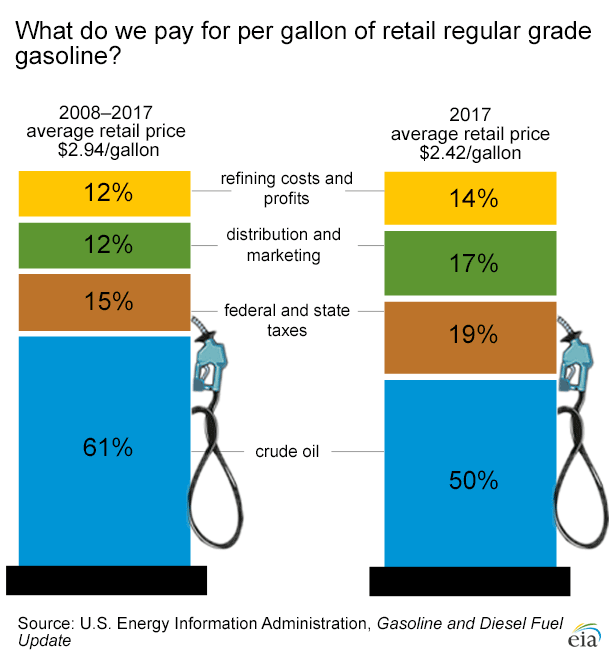 You pay 73.62 cents per gallon on state and federal tax for a gallon of gasoline and in Utah we pay around 47.8 cents per gallon for state and federal tax per gallon. Be glad you don't live in the UK where petrol typically sells for 3 to 4 times the US price. Ever wonder why everyone drives such small cars over there? Here in Californiagrad, new taxes have been collected for road repairs. We have seven refineries. Perhaps the new funds are hoarded to pay lawsuits when 5 year old cracked pavement throws passengers out of windows seats, safety belts and all? I believe chairman Brown wants 200% alcohol at the pump, regular unleaded in the scotch and higher taxes on marijuana. Our Costco gasoline is one dollar per gallon costlier than what this article headlines. If Sacramento had their way, government executives would be furnished with Muskmobiles with free fill-ups and Zil Lanes. Disgusting. The poor get poorer -- much poorer in this misguided utopia. I should know I live on Social Security. You can find gas for under $2 at many stations in San Antonio. The main reason of this wide spectrum is the level of taxation very different from one country to another. What's diesel going for in S. Texas? I expect to see regular gasoline here in Ohio River Valley drop below $2.00/gallon if the downward pressure stays on RBOB. Right now it's $2.19/gallon. Appears Russians are enjoying cheap fuel as well, if Guillaume's numbers are correct. I was surprised to see regular gas at $2.09 here yesterday in my small town. In the nearby "city," I am sure it is below $2.00 based on this price here, it's always cheaper there. I am sure it's well below $2.00 in Houston TX area. You'll see the cheapest fuel is in central Russia (Siberia and Urals) where oil producing regions are located.